In the face of rising competition and mandates to improve operational efficiency, large and critical power facilities need to keep power distribution systems running safety, reliably, efficiently, and in compliance with regulations. If you’re running a facility like a hospital, data center, or industrial plant, there are a number of hidden risks that make these goals even more challenging. The trend in digitization of electrical systems is helping reveal these risks and meet operational goals. This proven technology is available today. Still, if you’re like most organizations, you’re continuing to ‘work blind’, without the deep insights that a fully digitized power distribution system can deliver. Not convinced? Let’s first take a look at those risks. With electrical system issues recognized as the cause of 22% of all fires, finding sources of overheating should be a priority. In hospital operating theaters, insulation faults can put lives at risk, so specialized monitoring should be put in place. If a power outage takes place, power must be restored quickly to ensure occupant safety and to restore operations. Studies show power quality issues cause up to 40% of business downtime, causing massive costs in terms of lost productivity and equipment replacements. You need tools that can help you identify when conditions are deviating outside of safe parameters before things become critical. The US Department of Energy believes that buildings can be made 80% more efficient with the right technologies, even ‘net-zero’ if using onsite renewables. However, energy waste will remain hidden and renewables not fully leveraged without having detailed visibility into everything from billing, to consumption, to energy production. Maintaining power and building systems is another big hit to the bottom line, up to 35% of a building’s lifetime costs. Condition-based predictive maintenance can improve operational efficiencies, saving up to 20% a year. But this requires putting more powerful analytic capabilities in the hands of facility teams, and enabling new levels of collaboration with expert services. The need to meet emissions regulations and corporate sustainability goals is becoming more common. Healthcare facilities are often required to regularly test backup power systems. And every organization should ensure their energy provider is complying with power quality clauses of their contract. All of these requirements are onerous to manage without simple, effective analysis and reporting tools. To acquire the necessary data means depending more on connected systems, which raises the risk of cyber-attacks. Due to a lack of visibility into power and equipment conditions, most critical facilities are unaware of these risks. Many new and legacy facilities still use only a rudimentary level of technology to help prevent power system failures and minimize operational costs, usually on a reactive rather than proactive basis. Fortunately, there are now cost-effective ways to fully digitize your power system. You may even have many of the smart devices in place already, such as digital power meters and smart circuit breakers. You just need to get them connected and working together with analytic applications that will deliver the customized, actionable information each of your team needs at their desktops and mobile devices. The payback for doing this can be very large and the period very short, especially when considering all dimensions of ROI that you can achieve. For example, you’ll uncover lots of opportunities to optimize energy use and cut costs, but you’ll also get earlier warnings of risks, recover faster from problems, streamline maintenance and reporting, and boost the performance and lifespan of your equipment. And cybersecurity best practices will give you peace of mind. This has been the first in a three-post series. 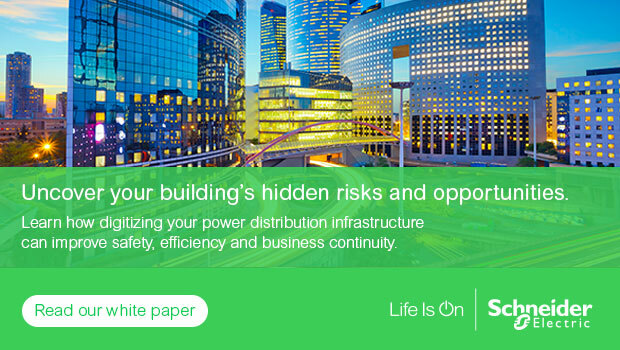 To learn more, download our white paper ‘Bringing critical power distribution out of the dark and into a safer, more reliable, and efficient future’. For more information, visit the EcoStruxure™ Power web page.